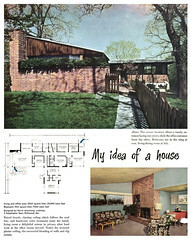 Armstrong's design of 1941 for the home and office of Dr. McCall on Manchester Road. This is the first page of an article about this project in Popular Home magazine. Article excerpt courtesy of the Harris Armstrong Archives, Special Collections, Washington University in Saint Louis.